Celebrate your birthday at City Buffet Fairview! A FREE Buffet is waiting for you! 1. Birthday celebrator can avail the Birthday Promo for 1 whole month as long as it is within the month of his/her Birthday. 2. Birthday celebrator may eat for (1) free buffet at CITY BUFFET FAIRVIEW. 3. To avail the birthday promo, the celebrator MUST be accompanied by minimum of 3 full-paying adult (rates without any discount/s). 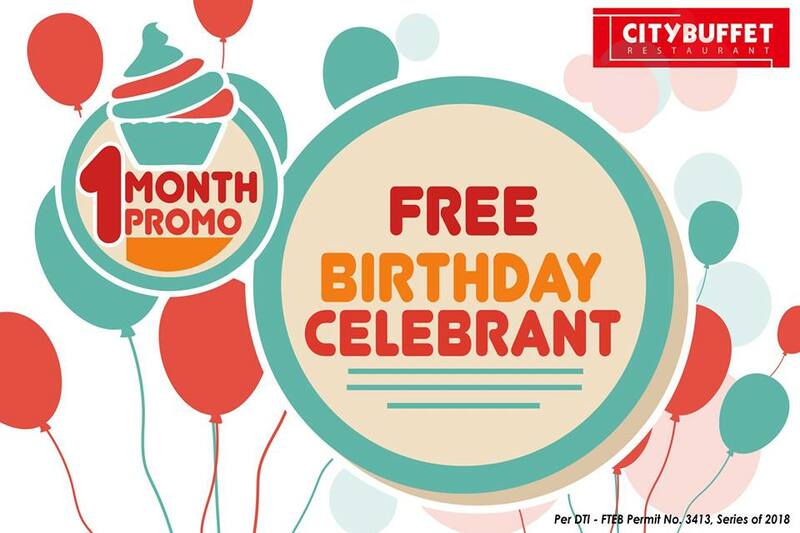 Rate is (1) Celebrator with (3) Regular rate to avail the promo. 7. Promo period is from March 01, 2018 to February 28, 2019.
pano pag sa mismong bday po kahit isang kasama ndi ba mafrefree ung may bday? Libre po ba ung celebrator kapag mismong birthday nya kakain? Basta dala birth certificate? Halimbawang 12kami lahat tapos 5 ung celebrant libre ba sila? Paano po kung 2 yong celebant pero 5 lng kmi? Family po. Libre p rin po b yong 2? Gud pm ask k lng po kung 5 members kmi at 2 ang may birthday, libre po b yong 2 celebrant? 5 members kme ng family 2 may birthday this month of November, pasok ba sa promo Yung dalawa? How much do ang rate per head if Sundays lunch time,still may 20 off parin ba fzenior sa Sunday! ?